Across early-modern Europe the confessional struggles of the Reformation touched virtually every aspect of civic life; and nowhere was this more apparent than in the universities, the seedbed of political and ecclesiastical society. Focussing on events in Scotland, this book reveals how established universities found themselves at the centre of a struggle by competing forces trying to promote their own political, religious or educational beliefs, and under competition from new institutions. It surveys the transformation of Scotland's medieval and Catholic university system into a greatly-expanded Protestant one in the decades following the Scottish Reformation of 1560. 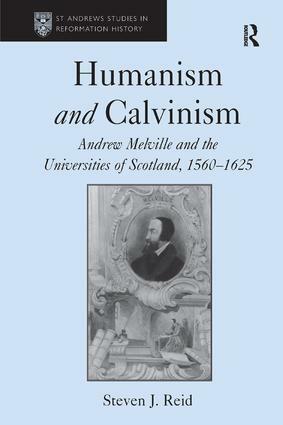 Simultaneously the study assesses the contribution of the continentally-educated religious reformer Andrew Melville to this process in the context of broader European social and cultural developments - including growing lay interest in education (as a result of renaissance humanism), and the involvement of royal and civic government as well as the new Protestant Kirk in university expansion and reform. Through systematic use of largely neglected manuscript sources, the book offers fresh perspectives on both Andrew Melville and the development of Scottish higher education post-1560. As well as providing a detailed picture of events in Scotland, it contributes to our growing understanding of the role played by higher education in shaping society across Europe. Contents: Introduction; Between Reformation and reform: the Scottish universities, 1560-74; Humanism and Calvinism: Melville's education, 1545-74; The first foray into reform: Melville and the 'ancient' universities, 1574-84; Reform and reaction at St Andrews, 1579-88; The rise and fall of 'Melvillian' St Andrews, 1588-97; The rise of 'the moderates' in St Andrews, 1597-1606; 'Godly' humanism, civic control: Scotland's Protestant arts colleges, 1582-c.1606; The Scottish universities post-Melville, c.1606-25; Conclusion; Appendix; Bibliography; Index.